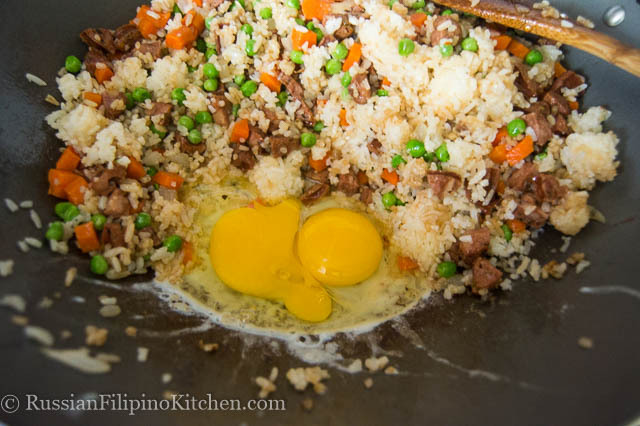 When it comes to breakfast nothing beats fried rice that’s a meal in itself. One serving has enough carbs, protein, and vegetables that wil keep you full for hours. It’s a comfort food that I can honestly eat any time of the day. 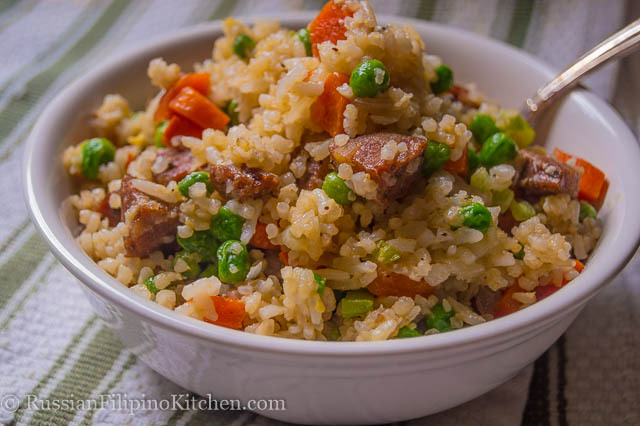 This version of fried rice has all the goodness of meat and vegetables that is light but filling. 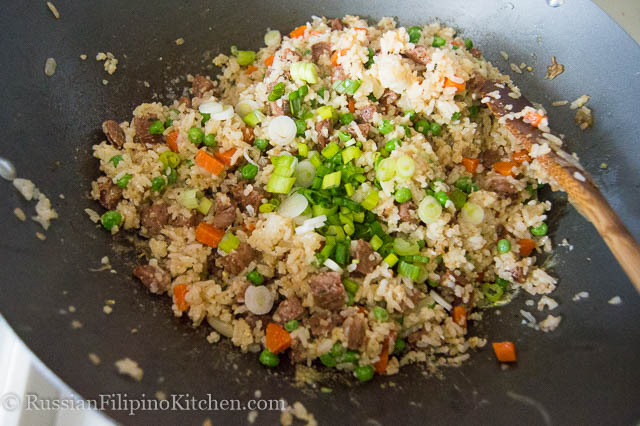 It’s not greasy or overly salty like most takeout fried rice. 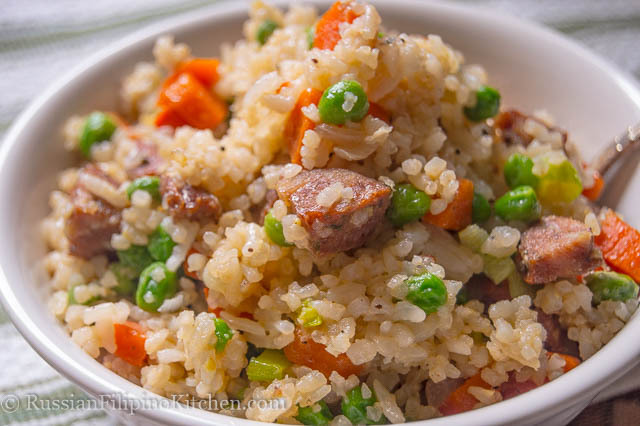 I use Italian sausage which adds another layer of unique flavor to this traditional rice dish. 1. 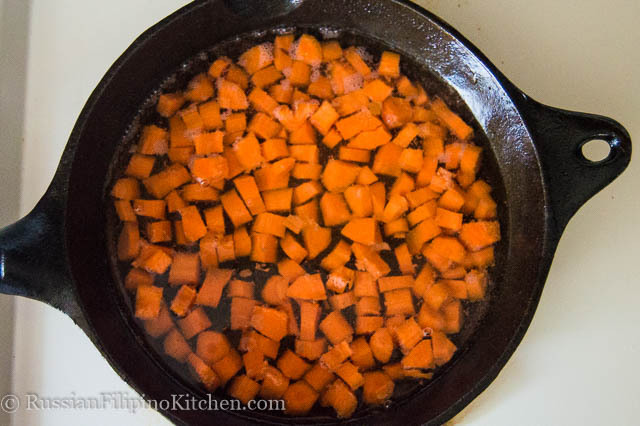 Fill a small skillet or saucepan with 1 cup water and add the carrots. Bring to a boil. Lower the heat and simmer for 5 minutes or until they’re soft enough to pierce with a fork or tip of a knife. Drain carrots and set aside. 2. Heat a wok on high and add the oil. 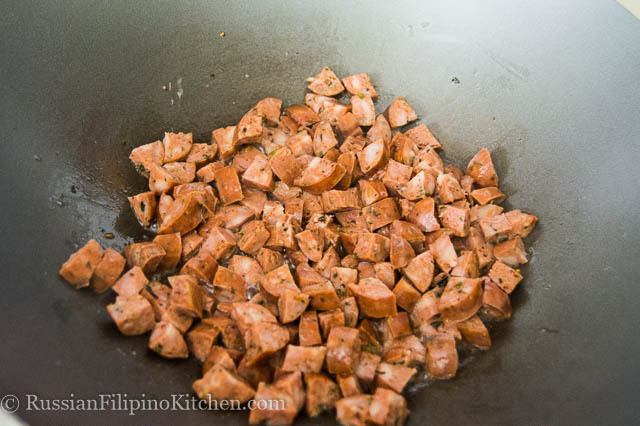 Add sausage and cook for 8 minutes until browned. 3. Add garlic and onions and sauté until onions become translucent. 4. 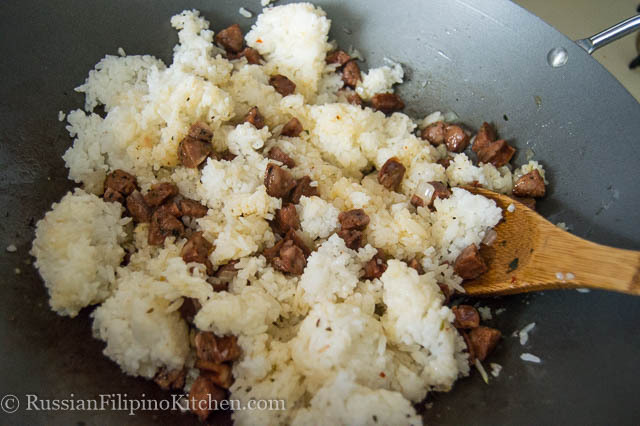 Add rice, separate lumps with cooking spoon, and stir fry for 2 minutes or so until it browned a little. 5. 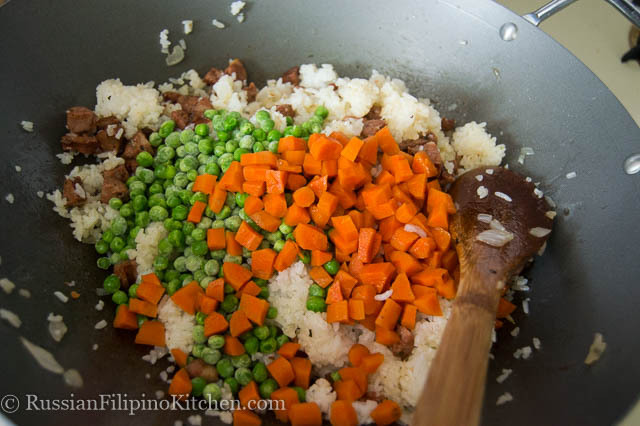 Add carrots and green peas and cook for another minute. 6. 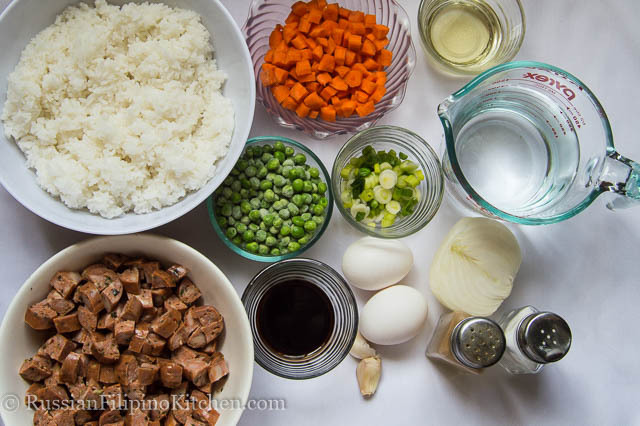 Add soy sauce and mix. 7. Move everything on one side of the pan, break the eggs and let it fry halfway. Stir and then mix with the rest. 8. Add green onions and cook for another minute. 9. Serve immediately. Fill a small skillet or saucepan with 1 cup water and add the carrots. Bring to a boil. Lower the heat and simmer for 5 minutes or until they’re soft enough to pierce with a fork or tip of a knife. Drain the water and set aside. Heat a wok on high and add the oil. 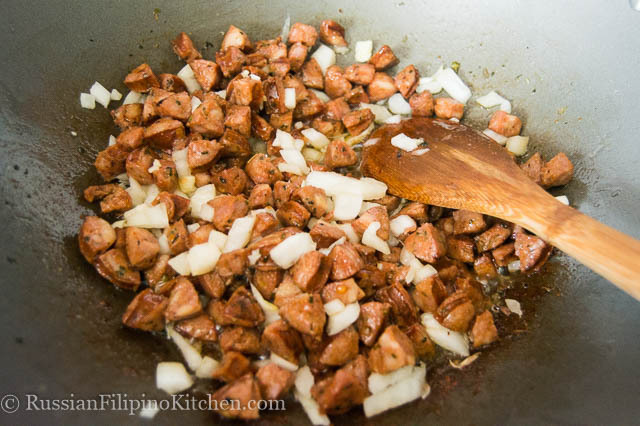 Add sausage and cook for 8 minutes until browned. Add garlic and onions and sauté until onions become translucent. 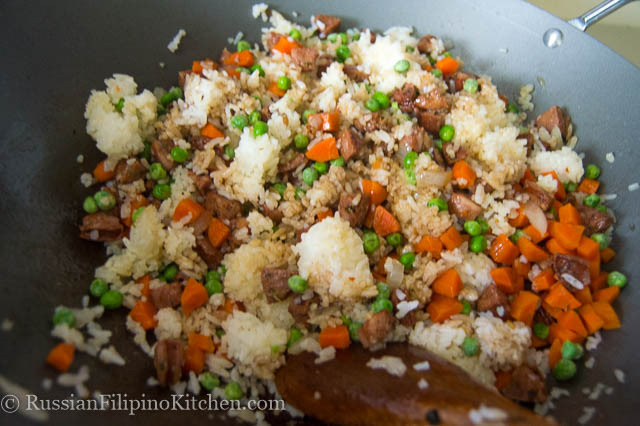 Add rice, separate lumps with cooking spoon, and stir fry for 2 minutes or so until it browned a little. Add carrots and green peas and cook for another minute. Move everything on one side of the pan, break the eggs and let it fry halfway. Stir and then mix with the rest.